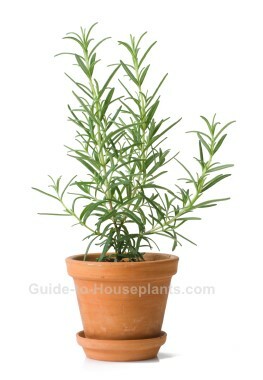 Growing rosemary plant on your windowsill is a great way to enjoy this aromatic herb year-round. If you're growing rosemary plant in your garden, dig it up before the first frost and bring it indoors. There's no reason why you can't enjoy fresh herbs in the winter months, too. Put rosemary on your sunny kitchen windowsill so it'll be handy for snipping fresh sprigs for cooking. You can move it back outdoors in late spring if you want. Don't know how to grow rosemary? It's easy. If you don't already have this plant, get one. This is one of the few herbs that really thrive indoors. Several varieties are available -- from bushy, upright plants to trailing rosemary. Some are even pruned into a topiary, giving this plant a tree form. Suggested varieties: Small, compact 'Blue Boy' is ideal for growing indoors. 'Santa Barbara' has a trailing habit that can be trained onto a hoop inserted into the pot. Native to the Mediterranean, rosemary grows best with as much direct light as you can give it. At least 6 hours of direct sunlight during the growing season will help it grow lush and full. 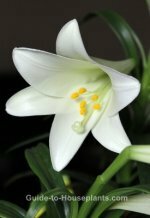 If you can't put it in a south- or west-facing window, move the pot outdoors in late spring or plant it in your garden for the summer. Growing rosemary with artificial light works well, too. Some kitchens have fluorescent lights above the counter -- an ideal spot for your culinary herbs. Cut it back to keep it looking neat. When pruning rosemary, always cut above a stem joint, and never take more than a third of the plant at a time. Rosemary sometimes gets powdery mildew -- a grayish-white fungus caused by lack of air circulation around the plant. Keep it where it will get plenty of air, but away from heat vents and cold drafts. Light: Bright light with at least 6 hours of direct sun per day. Turn your rosemary plant every couple days for even growth because it will tend to grow toward the light source. 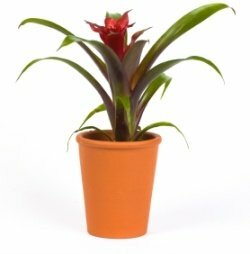 If you use fluorescent light, keep the light 6 in (15 cm) above the plant and leave it on for 14 hours a day. Water: Water thoroughly then allow top 2 in (5 cm) of the soil to dry out between waterings. Be careful not to overwater because this herb likes to stay on the dry side. Soggy soil will cause the leaves to turn brown and drop off. Planting rosemary in a terra cotta pot will help keep it dry and prevent root rot. Humidity: Average room humidity. Indoor air can get extra dry with the furnace on. Provide humidity in the winter by putting the herb pot on a humidity tray. Temperature: Warm in spring and summer 65-80°F/18-27°C. In fall and winter, cool 45-70°F/7-21°C. Soil: Use a potting mix that drains well, such as cactus mix. Or, use 2 parts all-purpose potting mix with 1 part sharp sand or perlite. Propagation: Take 3 in (7.5 cm) stem tip cuttings in summer. Dip cut end in water, then in hormone rooting powder. Tap off excess powder and insert the cutting in a pot of moist potting medium. Keep the medium lightly moist, but not soggy. Roots will develop in about 3-4 weeks.